Eyes: White with green vertical slits. Story: Eurial was the First Cenobite of the Alothur Necropolis who was excommunicated when she helped Pitt escape from Zoyvod. The Cenobites were at war with the Creed and would attack Pitt if they found him on Earth. She therefore hid Pitt in Shimmerspace until they were gone, which would be five years Earth time . By the time Pitt got back, she was gone. 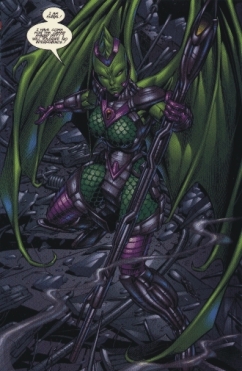 Skills & abilities: Apart from her wings giving her flight capability, no powers were mentioned.